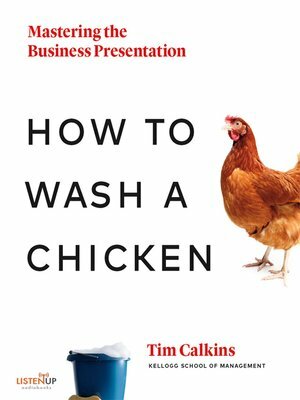 How to Wash a Chicken is not a book about public speaking (or chickens), it's a comprehensive playbook for business leaders and people on their way up to give the best presentations of their lives, and embark on a circle of presentation success. All too often, the best intentions and most innovative ideas get lost in a poorly executed presentation. Author Tim Calkins understands the power of a compelling presentation and the difficulty in accomplishing one. The brand strategist, professor and author have been giving presentations since he was eight, when he delivered his first official presentation with an uncooperative chicken at a 4-H competition. From business updates to project recommendations to marketing plans, Calkins has given more than five thousand presentations to date. With concrete suggestions, helpful tricks, and step-by-step guidance that's applicable to all industries, Calkins sets out to propel his readers to create and deliver effective business presentations and pitches. When all lessons from How to Wash a Chicken are applied, readers will be empowered throughout the preparation and presentation process. They will be able to present with more confidence and conviction than they ever had before, setting them on a path of professional growth.